Autism spectrum disorder (ASD) affects approximately 1 % of the human population and is characterized by a core symptomatology including deficits in social interaction and repetitive patterns of behaviour plus various co-morbidities. Although a lot of progress has been made to uncover underlying causes and mechanisms throughout the last decade, we are still at the very beginning to understand this enormously complex neurodevelopmental condition. 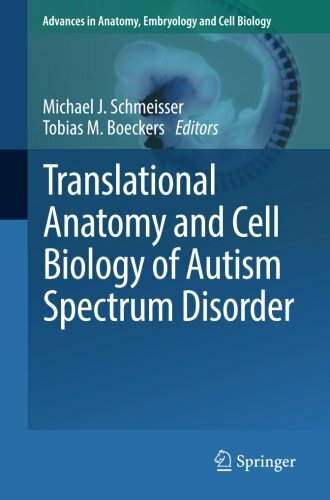 This special volume is focused on translational anatomy and cell biology of ASD. International experts from the field including several members of the EU-AIMS initiative launched by the European Union to develop novel treatments for ASD have contributed chapters on several topics covering all crucial aspects of translational ASD research with a special emphasis on ASD model systems including stem cells and animals. Primary objective is to clarify how anatomical and cell biological phenotypes of ASD will help to translate basic mechanisms to clinical practice and to efficiently treat affected individuals in the near future.